Size: 2.9" x 5.0" x 0.60"
This small Pocket Thesaurus is from the hardware and software almost identical to the RR-2 Thesaurus / Spell Checker introduced one year earlier. Dismantling this PS-4000 manufactured in 1990 in Taiwan reveals no surprises. The printed circuit board (PCB) sports a very clean layout and we identify the major components immediately. The hardware resembles more or less its predecessor RR2 but is now centered around a Toshiba T9989A Application Specific CPU instead of the original 8-bit Zilog Z80 processor. The program/word memory is labelled TC534000, a OTP-ROM with a capacity of 512k Bytes manufactured by Toshiba in Japan. The data memory of the PS-4000 is rather small with just 2k Bytes capacity. The dismantled PS-4000 makes use of a UMC UM6116 chip. The display driver of the PS-4000 Pocket Speller makes use of a traditional package but unfortunately is soldered "face down" to the PCB and we can't identify its manufacturer and type. Don't miss the PS-3000 Pocket Speller with almost identical hardware, using a smaller program/word memory with 128k Bytes capacity. 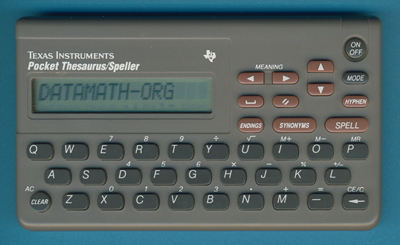 The PS-4000 Pocket Thesaurus / Speller is featured in the Texas Instruments Incorporated leaflet Pocket Solutions (CL-1059) dated 1990. This PS-4000 was donated by Irina Rouzaeva. Thanks! © Joerg Woerner, March 17, 2002. No reprints without written permission.